One thing about my ex-wife that used to drive me crazy was that she would never turn on the bathroom fan when she was taking a shower. I understood her reservations: The fan was noisy and it seemed to make our drafty bathroom worse when it was on; and besides, she liked it nice and steamy in there. Sure, the wallpaper was peeling off, and strange things were growing up in the corners, and yes, she would try to remember next time…but still that fan stayed off. I remember the considerable conflict of interest between the builder part of me and the husband part of me. I didn’t want to make an issue out of a problem that was, in the big picture, a rather trivial one. The problem was, we were both right: The fan was too noisy to be comfortable, but the bathroom needed to be ventilated, too. Fortunately, this problem is easy to fix because there are plenty of low-noise fans that are available that can move the proper volume of air that bathroom ventilation requires without necessitating earplugs. Not all bathrooms require mechanica\ ventilation. Those with operable windows that provide an open area equal to at least 10% of the floor area of the bathroom are excused by code, but not by common sense. Opening a window is a good idea and a simple way to bring in fresh air, but for children or the elderly this isn’t always an option. And it’s not always pleasant to have an open window on a cold winter day. So mechanical ventilation is usually a good idea, and there are ways to ensure that bath fans get used, too. One way is to couple the fan to a humidistat so that it operates whenever the bathroom environment reaches a certain humidity level. This is probably the best solution. Another approach is to put the fan on a timer; this doesn’t ensure that the fan will be turned on, but it does ensure that it will be turned off. A third approach is to wire the fan and main bathroom light so that they are controlled by the same switch. 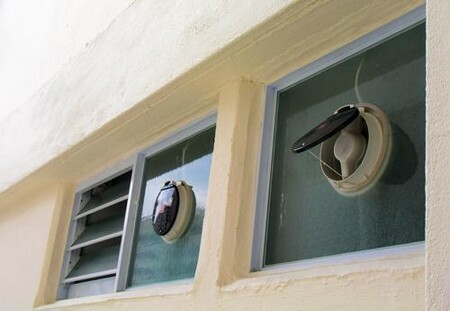 Of course, this solution means that the fan is on considerably more often than it needs to be, wasting resources by exhausting heated air out of the house and consuming electricity (though the current required by most fans is quite modest). Fan noise is rated in sones—the lower the sone rating, the quieter the fan. According to the Home Ventilating Institute (HVI), the noise level of a quiet refrigerator in a quiet kitchen is equal to about 1 sone. In technical terms, a sone is equal in loudness to a tone at 1,000 cycles per second (cps) at 40 dB above the threshold of hearing. A sone rating of 2 is twice as loud as a sone rating of one; a sone rating of 4 is 4 times as loud as a sone rating of 1. Some of the quietest fans are now rated at less than 1 sone, while anything louder than 3 sones is probably just too noisy for a residential bathroom. Fans are sized according to the volume of air they can move in cubic feet per minute (CFM). Research by the HVI indicates that the optimal air-change rate for most residential bathrooms is 8 per hour. This means that mechanical or natural ventilation systems should be capable of completely exhausting and resupplying fresh air to a bathroom 8 times over the course of an hour in order to ensure that odors and humid air are properly eliminated. To calculate the CFM capacity needed for a given-size bathroom, first determine the floor area and multiply that number by the factor 1.07 (assuming an 8-ft. ceiling). For example, 5 ft. by 9 ft. = 45 sq. ft. (floor area). Multiply that by 1.07 and you get 48.15, so the recommended fan capacity would be 50 CFM. When sizing a ventilation system, keep in mind that extensive duct runs and corners dramatically decrease the fan’s efficiency and may require that a larger-capacity exhaust fan be specified. Another variable to consider in calculation includes the length and type of the duct run. Flexible duct is easier to snake around obstructions but creates considerably more air resistance than rigid duct. 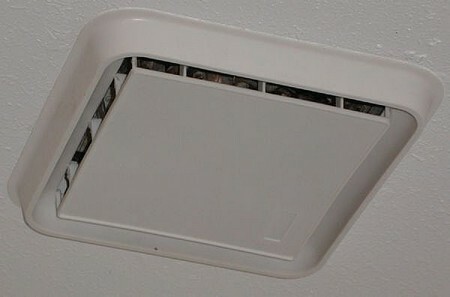 Again, duct runs with many turns and corners require a stronger fan to move the same volume of air than a relatively straight run. When installing the ductwork for a ventilation system, avoid the commonly available flexible plastic duct. This stuff is quick and easy to install, but I’ve seen too many of these installations where there are holes and leaks, or where the plastic has deteriorated. Galvanized aluminum or rigid plastic ABS or PVC ductwork is a far better choice in the long run. There are a number of different types of ventilation fans on the market, including those that are combined with lights and/or heaters in the same housing. Another option is to use a remotely mounted ventilator with multiple intake ports. These units are suitable for either intermittent or continuous ventilation; some are designed for use in a single bathroom, while others can ventilate a number of rooms simultaneously. Remotely mounted ventilators are generally quieter because they are isolated from the area being ventilated, though the HVI currently has no sone ratings available for these units. They are usually able to handle longer duct runs and can often can be located so that servicing them is easier.